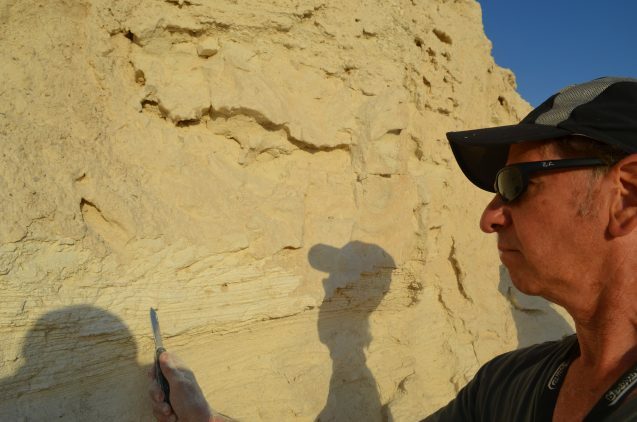 Perched on a cliff face in Israel’s Negev Desert, close to where the book of Genesis says the wicked cities of Sodom and Gomorrah were burned with divine fire, geologist Steven Goldstein was excitedly uncovering evidence of events even more ancient. Jackknife in hand, Goldstein carved into soft sediments making up the cliff, exposing layers left year by year going back 70,000 years by a now long-gone lake. Cleaning the face, he pointed out neatly alternating dark and light bands–primarily mud and light-colored minerals, respectively. The dark layers marked wet times, the light ones dry, that he could read and learn from–in essence a book much older than the Bible. Last year, Goldstein and his colleagues at Columbia University’s Lamont-Doherty Earth Observatory published a study based on similar sediments showing that droughts far worse than any recorded by humans have struck this region. Drilling a core of sediment from the sub-bottom of the nearby Dead Sea, they extracted a record going back 200,000 years. 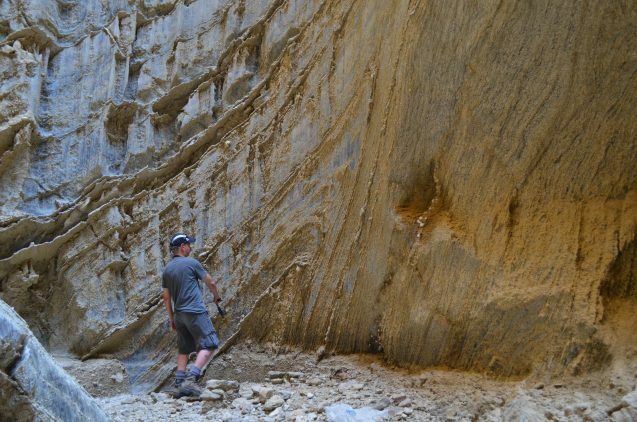 Here they found thick sequences of salt precipitated out during the hottest, driest times, when rainfall in this already sere region apparently plummeted to as little as a fifth of modern levels. This was 120,000 years ago, and again 10,000 years ago, both before the time of the ancient Hebrews and other early civilizations. The study has modern implications. In recent years, human-influenced climate warming has already measurably reduced rainfall and increased evaporation in the Mideast. At the same time, populations are multiplying. The result: worsening water shortages. According to the United Nations, the world’s 10 water-poorest countries are all in this region–and continued warming is on track to re-create the high temperatures associated with the past megadroughts by the year 2100. According to another recent study out of Lamont, the ongoing civil war in nearby Syria may have been sparked in part by a record 1998-2012 drought probably stoked by global warming. Israel and its neighbor Jordan, who sit on opposite sides of an uneasy border formed in part by the Dead Sea, already consume practically all available water in the sea’s watershed. As a result, the Dead Sea’s level is dropping fast. Land along its shores, and the infrastructure there, are collapsing. It could be a symptom of what is facing the wider region. Up to now, climate scientists had projected that rainfall could decline another 20 percent by 2100. But the Dead Sea cores suggest that things could become much worse, much faster. Goldstein inspects an ancient salt cave; its countless folded layers may hold clues to past climates. Kiro samples the walls of the cave. “We see that when this region becomes very warm, there’s a big decline in precipitation,” said Lamont geochemist Yael Kiro, lead author of the recent study, and a native of Israel. 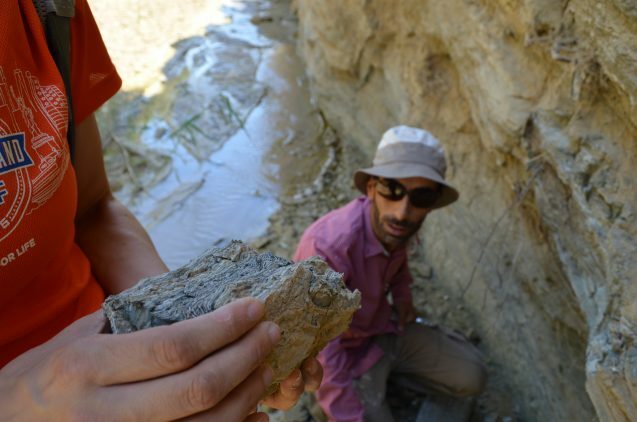 “When we look into what will happen in the future due to climate change, we expect that water resources will decline significantly.” Now on a five-day expedition to the Dead Sea shores of both Israel and Jordan, Kiro, Goldstein and colleagues were trying to refine their understanding of what exactly might happen. 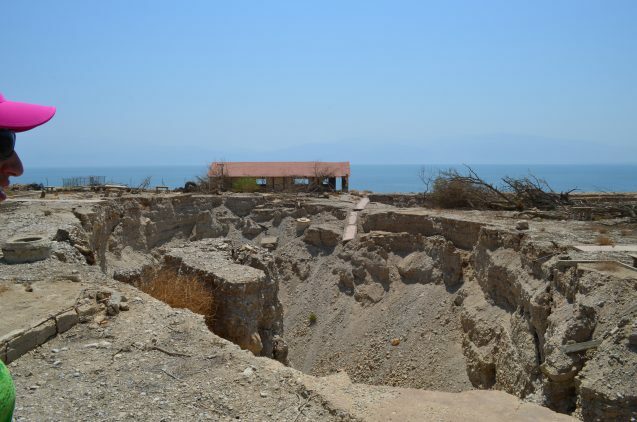 Surrounded by badlands and sand deserts, the landlocked Dead Sea region is the setting for many Biblical narratives, and other more recent historic events. It is also earth’s lowest point on land. Its current shoreline lies about 1,400 feet below sea level; the deepest part of its floor lies another 900 feet down. Fed mainly by the Jordan River drainage, it is a literal dead end for water. It is hot here, and much water that reaches the sea evaporates, leaving behind salt; it is nearly 10 times saltier than the ocean. Precipitated-out salt has built up on its bed and shores for eons–more in drier times, less in wetter ones. The Jordan River watershed also includes Syria, Lebanon and the Palestinian territories. and due to warming-induced changes in storm patterns, the region has seen about a 10 percent decline in rainfall since 1950. Now, the growing populations of the surrounding countries are sucking out practically all the Jordan’s declining flow before it reaches the Dead Sea. To make up the deficit, they are tapping the region’s declining deep groundwater. Starved of inflow and evaporating faster with mounting heat, the sea’s level is now dropping three to four feet a year–a total of about 130 feet since 1950. 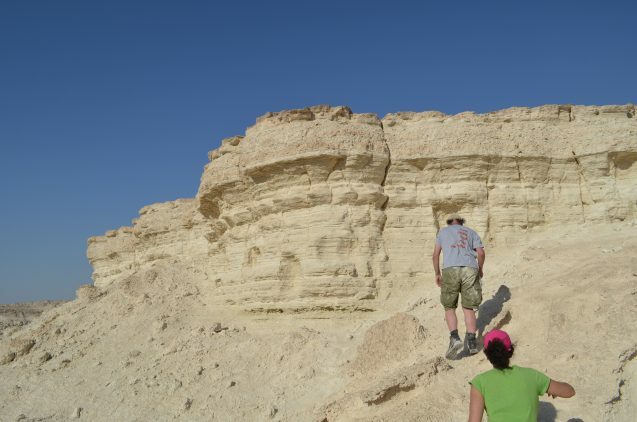 Kiro and Mordechai Stein of the Geological Survey of Israel (top) approach a cliffside deposit in the Israeli desert. The team began its most recent trip in Jerusalem, where Kiro and Goldstein hooked up with Mordechai Stein, a scientist with the Geological Survey of Israel. Piling into a small rental car, they drove through the precipitous Judean Mountains down toward the sea, about an hour and a half away. 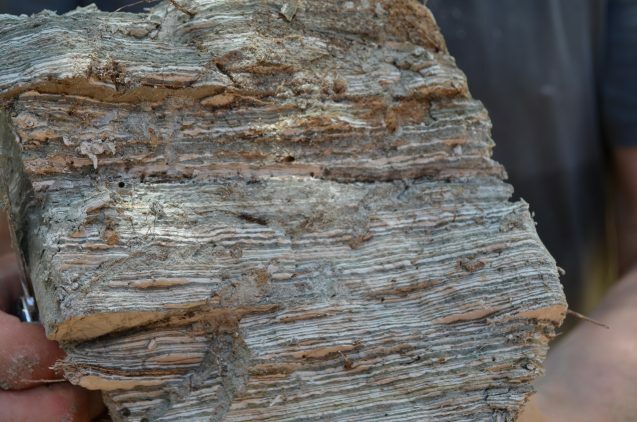 Along the way, Stein pointed out great swaths of white lakebed sediments draped over more ancient rocks, indicating that the sea’s level was about 800 feet higher than it is now, during the cooler, rainier times of the last ice age. Some 30,000 years ago, he said, the sea occupied the entire rift valley through which the Jordan now flows, extending north to what is now the Sea of Galilee. In a sample chiseled from a cliff face, alternating layers of whitish sediments and dark ones suggest past dry and wet periods, respectively. It was still morning when we approached the distant, shimmering surface of the Dead Sea. Still a ways off, we pulled up to a concrete-walled ruin. Stein identified it as The Lido, a onetime beachside restaurant. Its curving walls embraced what had been a big open-air dining room, with a little platform in the middle where musicians used to perform. 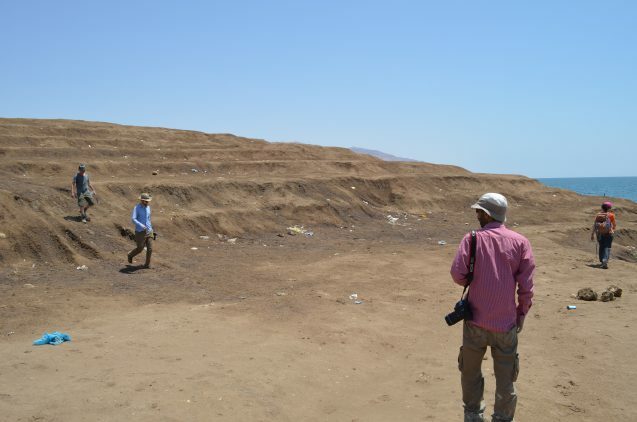 From here, stairs descended to what used to be the beach–which now was a good mile away across a barren, sunbaked expanse of dirt. The place closed around 1948, when the water receded. It had apparently been stable for a long time before that; through a big hole in the wall apparently blown out by an artillery shell, we could see a Roman-era stone pier at the same elevation. Goldstein observed that the water is now probably about down to where it was some 3,700 years ago, during a severe drought recorded in the sediments–possibly, he said, the same drought said by the book of Genesis to have driven the prophet Abraham to move his family from Canaan to Egypt. Driving south along the shoreline to the foot of Mount Sodom, we disembarked along a barren slope, where past water action had excavated a narrow cave. Following in on foot, we ended up in a stupendous chimney-like chamber that opened to the sky far above. The walls were made of countless alternating layers of mud and salt. 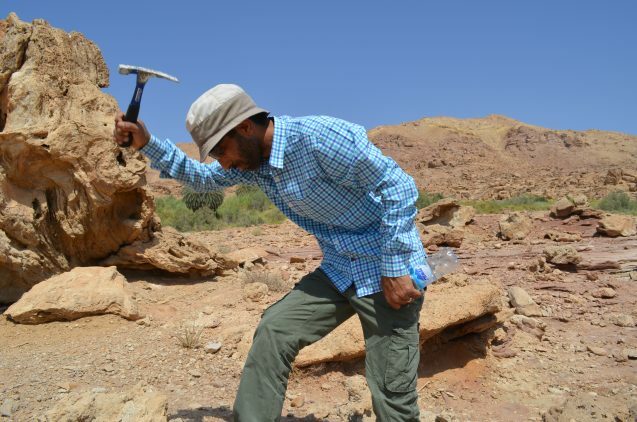 The team estimated these to be 6 million to 7 million years old–remnants of the bed of some pre-Dead Sea water body. Standing on tiptoe, Kiro hammered out samples from as high as she could reach, hoping to find clues to these truly ancient climates. A more thorough investigation would probably have to wait, said Goldstein, until someone comfortable hanging from a rope could rappel from the top of the chimney to sample more layers. Jutting from the top of a cliff just down the road was a big natural column of similar-looking sediment, pointing into the sky like a giant finger. A sign along the road below said it was “Lot’s Wife”–alleged remnants of the Biblical character who looked back on the burning remnants of Sodom and was turned to a pillar of salt. Stein was skeptical. “Actually, look, you can see it’s a pillar of salt and mud,” he pointed out. At another point, we passed the great fortress promontory of Masada, where 1,000 Jewish defenders committed suicide in the year 72, rather than be taken by a besieging Roman legion. 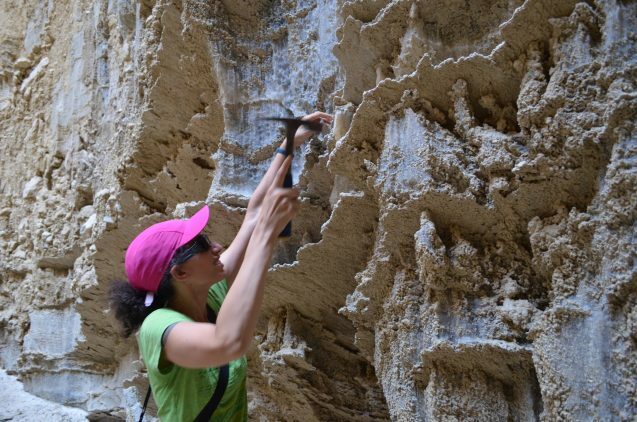 “Those sediments on top are 14,000 years old,” said Goldstein helpfully. 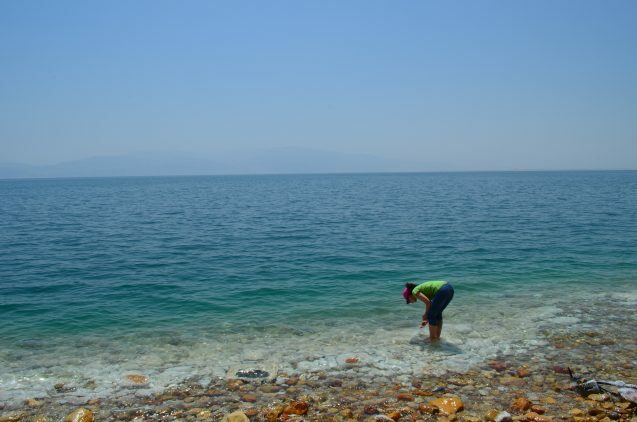 Due to warming climate and overuse of water, the Dead Sea’s level is plummeting. On the Jordanian shore, the team descends giant stair steps to the beach. Each step marks a yearly drop of about three feet. At one turn, the road detoured sharply inland. We pulled off, and walked toward the shoreline. Here, a long stretch of the previously straight asphalt roadbed was crumpling into the ground. Nearby lay the sinking wreckage of a onetime highway rest area and beach resort–now stranded on a cliff about 60 vertical feet above the current water line. The collapse began in the 1990s, when retreat of the sea allowed freshwater to infiltrate and dissolve underground salt layers. The place finally closed a few years ago. A 50-foot deep chasm was now swallowing concrete picnic tables and pathways, and ranks of glacier-like crevasses snaking through the surrounding surface suggested the process would continue. An abandoned gas station, pumps stripped to skeletal insides, awaited its turn. The scientists came to a tornado-shaped, seemingly bottomless sinkhole along which the remains of a building foundation teetered. Edging up cautiously, they peered into the blackness. “It’s a manmade environmental disaster,” said Kiro. “It used to be so nice. Coming here now just makes me sad.” She hiked down to the newly formed beach, waded into the shallows and fished out some salt chunks forming on the rocks, to compare with ancient samples. One result of dropping sea level: land along the shoreline is collapsing. Here, a sinkhole swallows the remains of a onetime Israeli beach resort. That evening, we passed the sea’s southern tip and stayed the night in the resort town of Eilat, along the shore of the Red Sea. Next day we crossed the fortified land border into Jordan, and proceeded back north to check out the sea’s opposite shore. In the 112-degree heat, completely barren granite mountains and expanses of sand were broken mainly by military watch towers looking across at Israel. Kiro stopped to dig a out a baggie of sand probably worn off those mountains–possibly useful in pinpointing the sources of sediment in ancient mud layers. No sooner was she done than a truckload of soldiers from the nearest watchtower pulled up and piled out of the tarp-covered back. An officer waited patiently for us to approach. A conversation cobbled from English, Arabic and Hebrew seemed to quickly satisfy him that we were weird but harmless. He simply asked that we please get in the car and continue our journey. Following a preplanned route, we presently found a turnoff onto a dirt road leading to a wadi, a narrow canyon carved deep into the ancient rock. On foot just beyond its mouth, we could hear water gurgling, and came upon the startling sight of flowering trees and tall reeds swaying in the breeze. Scattered hidden springs like this have been used for millennia by farmers and nomadic livestock herders who still roam the area. Part of the Dead Sea’s water comes from small streams trickling through side canyons. In Jordan, the team sampled a series of these to analyze the water chemistry. In another Jordanian canyon, friends cool off in the 110-degree heat. Downstream, most of the water will be used for irrigation and household needs; little will reach the Dead Sea. The team wanted to better understand their role in supplying runoff to the Dead Sea. They pulled out sampling bottles and instruments to analyze water chemistry and other qualities–a process they would repeat at other wadis over the next few days. At all, it was evident that little to none of the water now reaches the sea; concrete dams channeled their flow into troughs and pipes leading to irrigated lands below.. Hardly a new idea; on the way out of this first wadi, we stopped to admire the arched ruins of a Roman aqueduct paralleling the modern pipe. Long ago, it must have served the same purpose, but probably when there was more rainfall and fewer people. The following day in the capital city of Amman, we met Marwan Al-Raggad, a 37-year-old hydrologist at the University of Jordan. Al-Raggad, full of facts and figures, gave us a detailed rundown of Jordan’s water woes. Prosperous Israel, he pointed out, is water hungry too, but copes in part through expensive desalination of water from the Mediterranean. Poor, landlocked Jordan, population now 9.4 million, has had no such option. Amman began pumping groundwater in the 1980s, but its aquifers are dropping; he predicts they will run out in 20 or 30 years. A decade ago, Amman residents could turn on the tap any day of the week; now, it is down to just a day or two a week in many neighborhoods. “Except the ones where rich people and diplomats live–they get water 8 to 10 days a week,” Al-Raggad joked. People fill rooftop tanks for bathing and washing, he said, but don’t dare drink the stuff, because it often looks and smells bad. He estimated that 70 to 90 percent of city residents now drink only bottled water. About 15 percent of the national electricity supply now goes to pumping water, he estimated. Shortages have been exacerbated because Jordan has generously taken in some 1.3 million refugees from the next-door war in Syria–a nearly 20 percent population increase in just a few years. 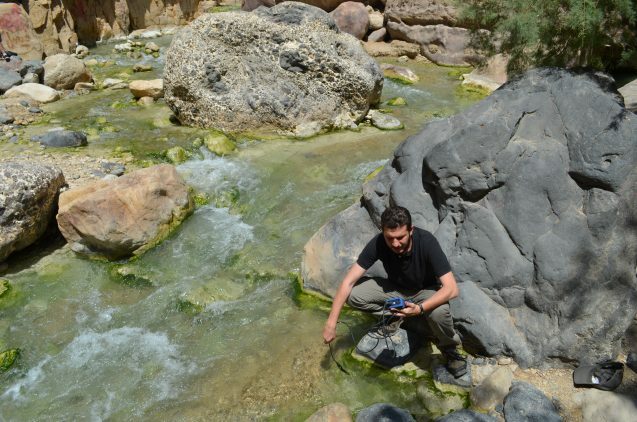 Marwan Al-Raggad, a hydrologist at the University of Jordan, takes water shortages personally; the oasis town he grew up in has been withering due to excessive groundwater pumping. With international help, in 2018, Jordan hopes to break ground on a canal to bring water from the Red Sea for desalination. Brine left over from the process would be dumped into the Dead Sea, possibly helping prop up its level. But the project is controversial, because it might cause ecological damage to both the Red Sea and Dead Sea, and will not by itself fill the country’s needs. Al-Raggad thinks Jordan will have to buy groundwater from Saudi Arabia, which has bigger, but not endless, reserves. We drove to the suburbs near the Dead Sea. Here, too, the plunging water table is reshaping the surface. Extensive deep gullies are forming as seasonal rains send surface water rushing over sediments a mile or two from the receding shore. Al- Raggad led us down a path into one gully, but backed off when we heard a pack of wild dogs snarling around the corner. Mohamad Alqadi, a Jordanian PhD. student at the University of Munich, tests pH and temperature of stream water. Al-Raggad and Kiro check out the walls of a newly carved-out canyon. Cross-border collaboration between Israeli and Jordanian researchers is unusual; the scientists hope to make it less so. We drove down nearer to the shore, and Al-Raggad talked his way past a couple of policemen on guard there. Here, our gully reached the sea. To get to the water’s edge, we had to descend a dozen giant stair steps, each about three feet high–each one a beach line formed over a year or so, marking the severe annual drops of the sea’s level. At the bottom, waves lapped up on this year’s temporarty beach. Plenty of plastic trash–mostly water bottles–had washed onto shore. 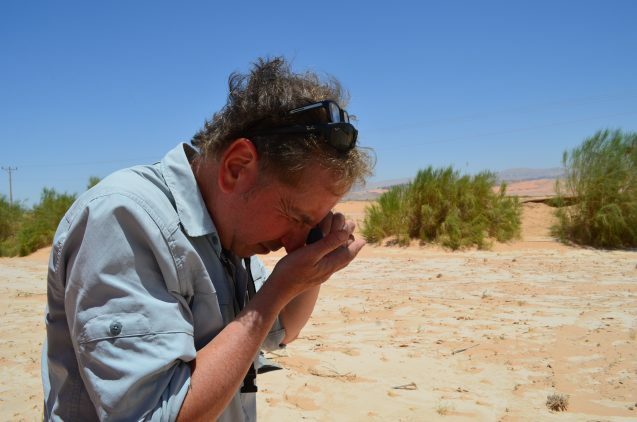 In the southern Jordan desert, Goldstein checks out the local geology up close.